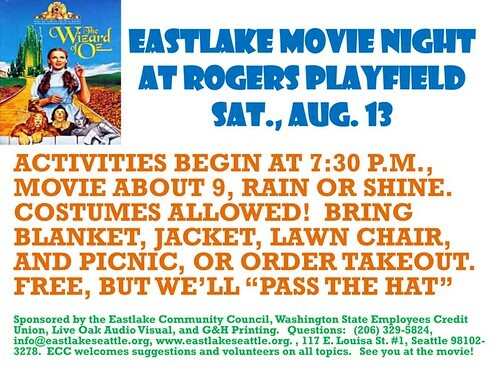 The annual Eastlake Movie Night returns this coming Saturday, Aug. 13, at 7:30 p.m. on the Rogers Playfield, 2500 Franklin Ave. E.
This year’s movie under the stars will be “The Wizard of Oz.” Activities begin at 7:30 p.m. and the movie starts about 9 p.m. You’re encouraged to bring your picnic or you’ill be able to order takeout from one or more local restaurants at the event. Also, be sure to bring lawn chairs to sit on, jackets and blankets. This is always a fun event and a great chance to enjoy a classic movie with your neighbors. Eastlake Movie Night is sponsored by the Eastlake Community Council, the Washington State Employees Union, Live Oak Audio Visual, G&H Printing and National Frozen Foods. Admission is free but they’ll be passing the hat for donations to help pay for the event. The Eastlake picnic that was scheduled for next week has been combined with this event. For more information, contact the community council at info@eastlakeseattle.org or 206-329-5824. UPDATE: This post has been changed since it was first published. Another sponsor has been added. This entry was posted in Uncategorized on August 8, 2011 by cdmilton. July 28: Accident investigation, 2700 block of Eastlake Ave. E., 11:14 a.m.
July 28: Bicycle theft, 1900 block of Franklin Pl. E., 12:49 p.m.
July 28: Car prowl, 1900 block of Harvard E., 8:30 p.m.
July 29: Car prowl, 2600 block of Franklin Ave. E., 11:01 a.m.
July 29: Car prowl, 2800 block of Boylston Ave. E., 8 p.m.
July 30: Disturbance, 1600 block of Fairview E., 1:23 a.m.
July 30: Dumpster fire, 1800 block of Eastlake Ave. E., 8:05 p.m.
July 31: DUI (driving while under the influence), Boylston E. and E. Lynn, 1:41 a.m.
July 31: Auto theft, 2300 block of Franklin Ave. E., 10:09 a.m.
July 31: Fraud, including identity theft, 2900 block of Eastlake Ave. E., 6:25 p.m.
Aug. 1: Accident investigation, 2300 block of Eastlake Ave. E., 1:39 a.m.
Aug. 1: Accident investigation, Fairview E. and E. Boylston, 2:02 p.m.
Aug. 1: Fight, E. Garfield and Fairview E., 7:09 p.m.
Aug. 2: Water rescue, 2900 block of Fairview Ave. E., 5:02 p.m.
See complete map at SeattleCrime.com. This entry was posted in Uncategorized on August 2, 2011 by cdmilton.